My parents live on a farm in Mississippi and they have about 30 Rhode Island Reds. 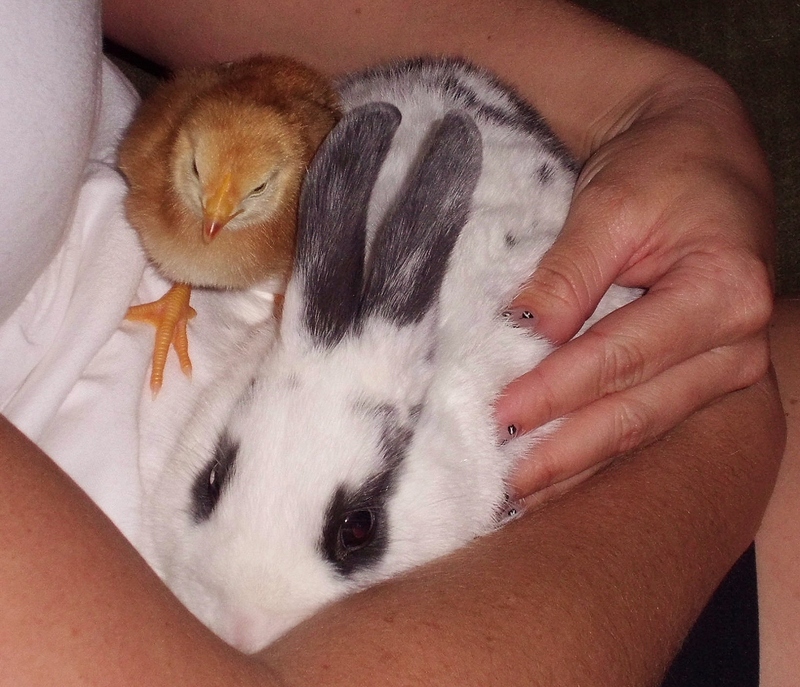 Daddy recently tried to hatch a clutch of fertile eggs in an incubator. He wasn’t sure if the eggs were actually fertile so he took a gamble. Only one little chick hatched. 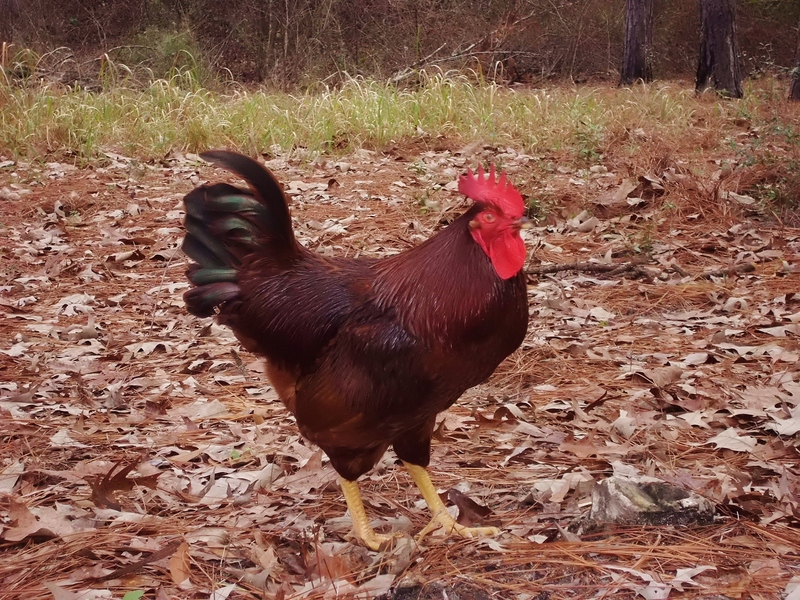 Dad has two beautiful roosters, but neither would own up to the deed. It’s improbable that a lone chick will survive since they need the warm bodies of other chicks to thrive and grow. Mom & Dad brought the baby inside and put a heating pad, food & starter feed in a cardboard box. Mom put one of her fleece lined slippers in the box for a warm nest. The little trooper survived the first day, and then the next, and the next, until it looked like she was going to make it. She thought my dad was her mommy and she was very content to sit on his shoulder for hours during the day. If he walked around the kitchen, she followed him, cheeping at full volume for him to pick her up. I bought him this shirt last Christmas. 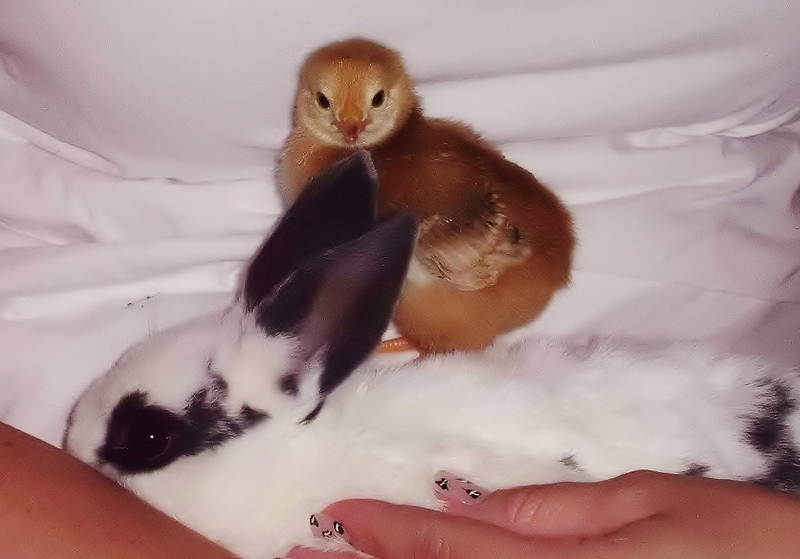 My parents knew that I was sad after having to give up my three back yard chickens, so they offered me the chick to take home and raise up to coop age. I jumped at the chance. She made the 280 mile trip to our house peeping, pooping and sleeping the whole way. When we got home, we fixed up Bitsy’s cage for her new home. Bitsy didn’t need a cage anymore since she was using her litter box and behaving nicely with her big brother. We decided she was a girl (we actually have no idea) and named her Scarlett, since she is a Rhode Island RED! My neighbors came over to see Bitsy and they got a bonus! I wanted Scarlett to feel another soft animal body for the first time, and they don’t come any softer than Bitsy. We put the little babies together in my friend Lauren’s arms. 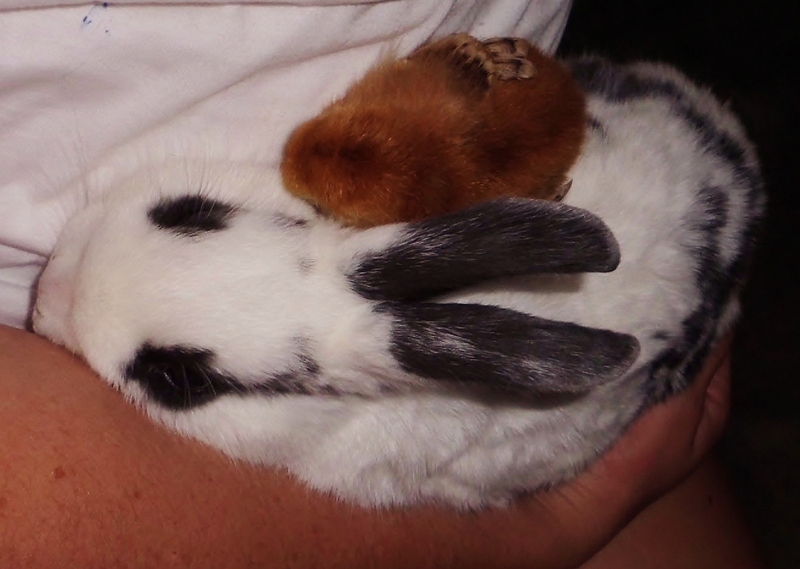 Bitsy was very still and Scarlett settled down into the soft fur of her new friend. In less than 30 seconds Scarlett was sound asleep. Sweet little Bitsy sat still the whole time letting Scarlett get her first cuddle with another of God’s creatures. These two little creatures were orphans no more. This entry was posted in Bunnies, Chickens. Bookmark the permalink. Jim said that picture of Grandud should be a poster. 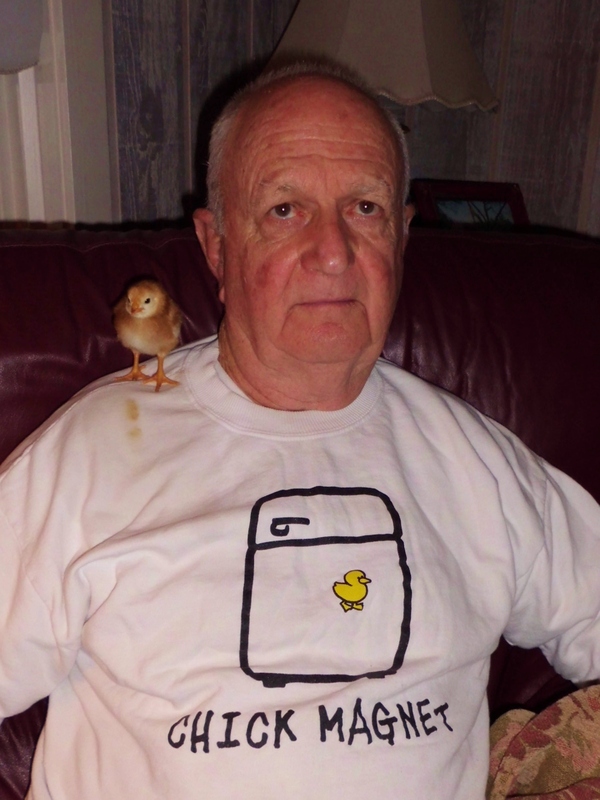 Thanks Gary, you can’t keep a good chickenwoman down! Agree. Interspecies love is always heartbreakingly cute. Hang on to your hat Renee. Sorry. Get some tissues.